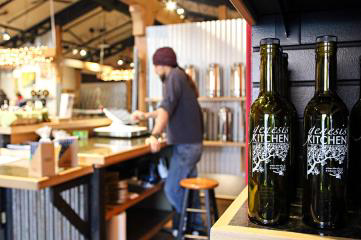 Genesis Kitchen's new shop at the Stumptown Marketplace in Whitefish on Feb. 13, 2019. Greg Lindstrom|Flathead Beacon. When David Cohen received word that the building that’s housed Genesis Kitchen since 2012 was reclaiming the space, it could have spelled disaster for his artisan olive oil and balsamic vinegar shop. Read through to the part about local doctors prescribing high-polyphenol olive oil. Maybe it's the tapas or the paella, but Spain has just surpassed Italy to become the world's healthiest country. That's according to the 2019 edition of the Bloomberg Healthiest Country Index, which ranks 169 economies according to factors that contribute to overall health. Spain placed sixth in the previous gauge, published in 2017. Australia ranked seventh in the new index. The Australian Competition and Consumer Commission (ACCC) has published its latest report on activity in the agriculture, small business and franchising sector. The report covers compliance and enforcement activities undertaken between July and December 2018, including facts such as reported small business scam losses of $4.7 million. View the report here. Rising figures for Australia’s greenhouse gas emissions show that the Federal Government is failing to protect Australian farmers and their livelihoods, said Farmers for Climate Action this week. The booming organic industry has grown a significant 88% in just seven years. 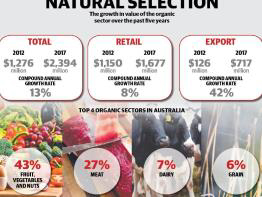 According to the 2018 Australian Organic Market report, the nation’s organic industry is worth $2.4 billion, with annual exports of $700 million. Got something to sell, or want to buy? You can reach your target market directly with Olivebiz Classifieds. If you’ve got something industry-related to sell, our online Classifieds service is an easy and inexpensive solution to advertise your unwanted equipment, extra oil - or even your grove. Like Helen, who has a surplus of Jumbo Kalamatas this year and is looking to sell them. And if there’s something you’re looking for, it’s the ideal way to get the message out loud and clear to your peers and industry associates. Integrated pest management (IPM) combines the use of biological, cultural and chemical practices to control insect pests in agricultural production. It seeks to use natural predators or parasites to control pests, using selective pesticides for backup only when pests are unable to be controlled by natural means. It’s also the focus of the recently-completed nationwide AOA IPDM Field Day program. If you missed out on attending, or want a recap of the information, you can view videos and presentations from the events 24/7 on the OliveBiz website here . After moving to regional Victoria in 2012, Melissa Connors identified a knowledge gap between the older generation of farmers and ‘tree-changers’ such as herself. To bring the two groups together, Melissa established This Farm Needs a Farmer and was recognised for her contribution to agriculture by taking home the 2018 AgriFutures Victorian Rural Woman of the Year award. 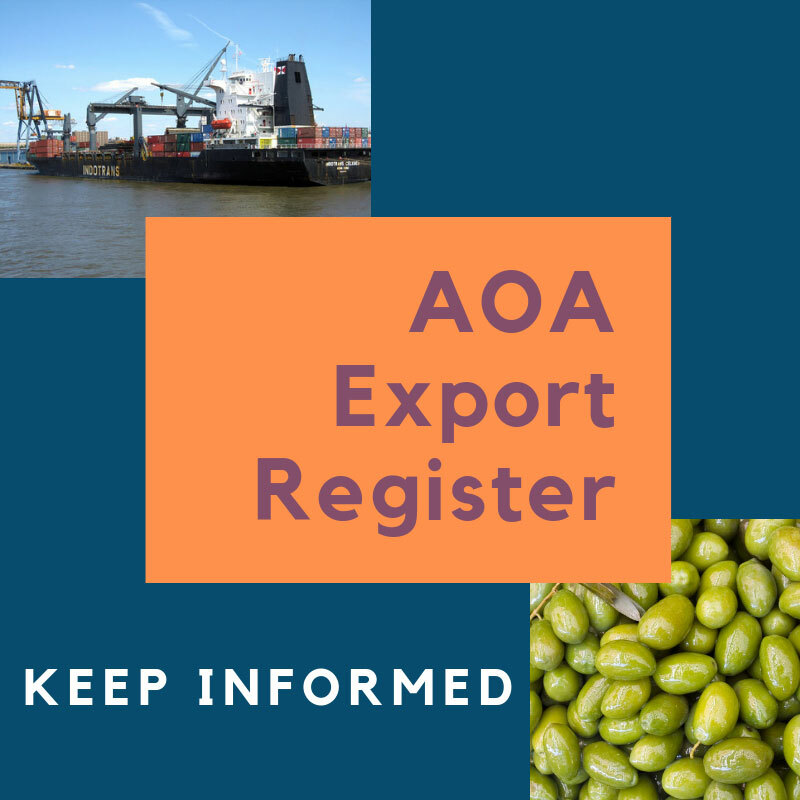 The Export Register has been set up to facilitate a targeted means of communication for AOA members interested in specific export markets. If that’s you, sign up and you will be notified when the AOA receives specific information about these markets and any associated inquiries. Make sure you get along to one of the ongoing workshops to share your ideas and insights how Hort Innovation can support better alignment between the needs of the sector as a whole and the strategic direction of the company. 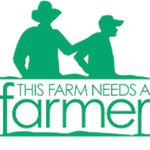 Workshops this week include Lindenow, VIC - 5 March, Shepparton, VIC - 6 March and Werribee, VIC - 7 March. Find out more about the Hort Innovation Strategic Plan stakeholder consultation, and find a workshop in your region, here. Imogen and Leon Bettio, Elisi Grove. 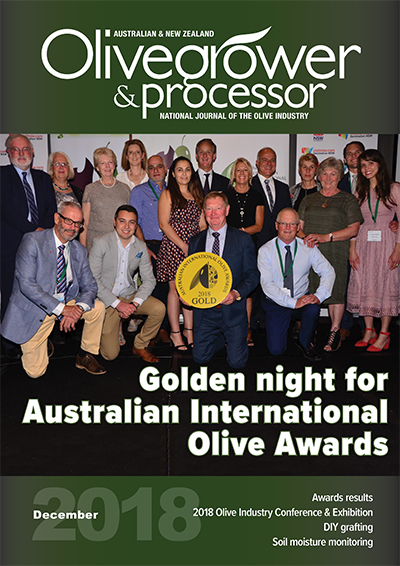 Harvest and the new seasons oils are on their way, as is the chance for peer review and a celebration of the best of the 2019 harvest via the Australian International Olive Awards. 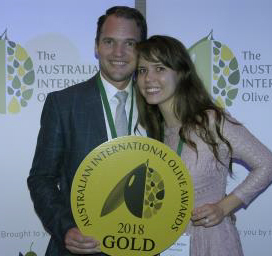 Australia’s premier EVOO and table olive competition, with the added benefits of international status and promotion, the Australian International Olive Awards is the “must enter” event on the competition calendar. Want to hone your pruning and shaping skills, while helping to revitalise an important national site? Grab your lunch, pruning tools and equipment, and head to Roseworthy on Saturday, March 16 for a working bee at the Roseworthy National Olive Varietal Assessment (NOVA) site. Guided by grove management and pruning expert Peter Cox, Olives SA members and friends will give much-needed TLC to the site’s neglected trees, as the first part of a long-term rejuvenation and re-purposing project in collaboration with the University of Adelaide. The action will happen from 9am-2pm and all interested parties are welcome. Please RSVP to Michael Johnston on 0419 815 839. 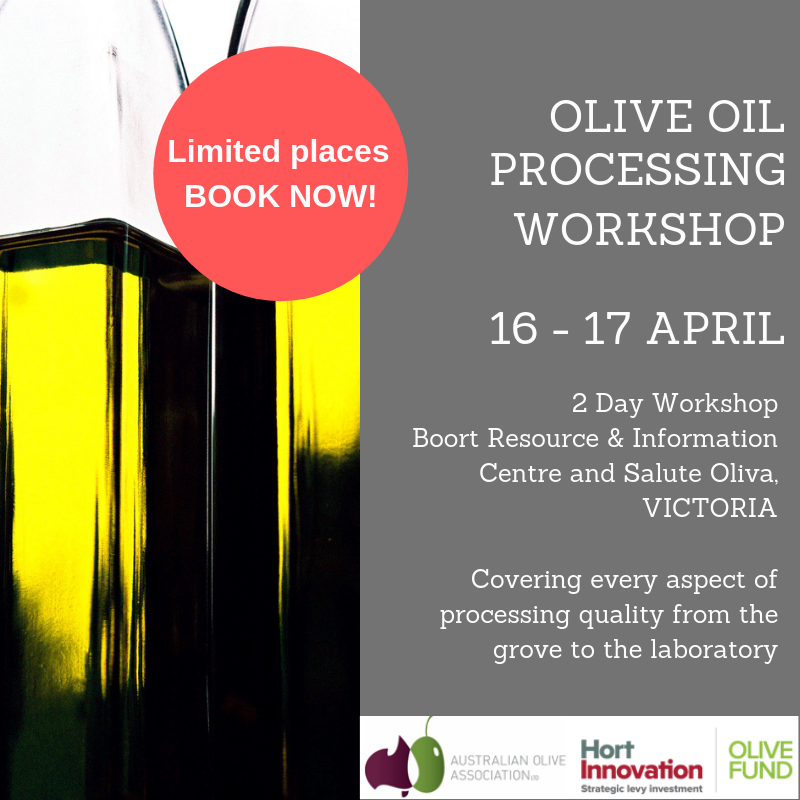 The AOA is running an Olive Oil Processing Workshop in April, being held at Boort, Victoria. The comprehensive two-day course covers every aspect of processing quality from the grove to the laboratory, and combines the expertise of international processing consultant Pablo Canamasas and award-winning producers Peter and Marlies Eicher of Salute Oliva. Where: Boort (Boort Resource & Information Centre/BRIC and Salute Oliva); Accommodation at Boort Lakes Holiday Park. Registrations are now open, so BOOK NOW – places are limited and this is one course you don’t want to miss! More information and register here. This project has been funded by Hort Innovation, using the Hort Innovation olive research and development levy, co-investment from the Australian Olive Association and contributions from the Australian Government. All growers should now have registered with their local Council, with National Programme documentation verification and registration either completed or underway. Olives NZ has three templates available to simplify preparation of the documentation: National Programme One for growers, National Programme One with bottling exemption and National Programme Three for all others, including processors. The templates are $250 each, including GST, and have been well received by Councils and MPI. Email admin@olivesnz.org.nz for more information and to purchase. Not long until final round of Focus Grove Field Days – don’t miss out! More information on the Focus Grove Project here. Includes some interesting contemplations on elements which may affect EVOO flavour profiles and chemical composition. Scientists with the USDA's Agricultural Research Service are using drones to sample irrigation ponds for E coli. This could give farmers a new tool to avoid spraying potentially harmful bacteria on crops. Watch the video here to find out more (2:04). Today’s increasingly complex, fragmented and global food supply chains have led to a steep increase in food fraud, according to Bühler and the only way to tackle it is enhanced transparency across the entire value chain and emerging digital technology. Olive oil has long transcended the boundaries of the kitchen that this type of oil is now also used in different applications primarily for its many health benefits. One very interesting usage of olive oil is in a number of canine health conditions. My fur-baby wanted me to remind you to share the EVOO goodness with ALL the family – Ed. Which means we should all be eating EVOO and olives ‘Everyday’! 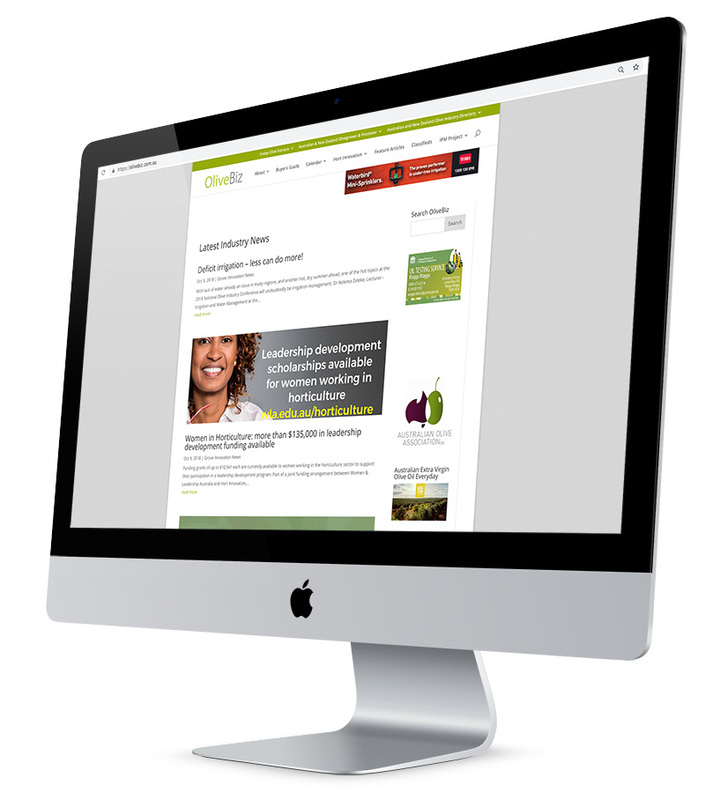 With 2019 now well underway , Friday Olive Extracts (FOE) continues to bring all the latest industry news and events to your Inbox every week. 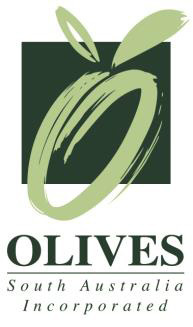 THE place to share olive industry news, event details and reminders, our industry e-newsletter keeps growing in popularity and we now have nearly 4000 subscribers across the globe. If you’re not one of them, you can sign up here. Drawn by an interest in health benefits and sustainable production, professionals from fields like law, medicine, and jewelry making have been turning to Greek olive oil. Loutraki Oil Company’s Athanasios Katsetos and Maria Guadagno Katsetos share with evo3’s Stratis G. Camatsos a dedication to using Greek extra virgin olive oil to help improve the world. We’re an interesting and diverse bunch, we olive people!